Over the past two decades, methods for the development, evaluation, and testing of survey questionnaires have undergone radical change. Research has now begun to identify the strengths and weaknesses of various testing and evaluation methods, as well as to estimate the methods’ reliability and validity. Expanding and adding to the research presented at the International Conference on Questionnaire Development, Evaluation and Testing Methods, this title presents the most up-to-date knowledge in this burgeoning field. 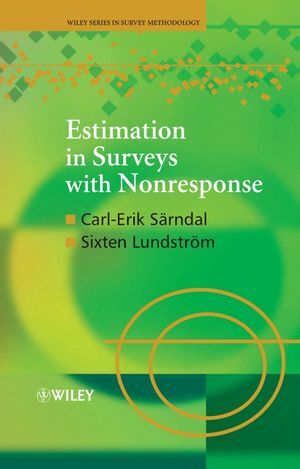 Comprehensive and carefully edited, this groundbreaking text offers researchers a solid foundation in the latest developments in testing and evaluating survey questionnaires, as well as a thorough introduction to emerging techniques and technologies. STANLEY PRESSER is a Professor in the Sociology Department and in the Joint Program in Survey Methodology at the University of Maryland. JENNIFER M. ROTHGEB is a Social Science Statistician at the Center for Survey Methods Research in the Statistical Research Division of the U.S. Census Bureau. MICK P. COUPER is an Associate Research Professor at the Institute for Social Research, University of Michigan, and at the Joint Program in Survey Methodology, University of Maryland. JUDITH T. LESSLER is Vice President, Partnership for Genomics and Molecular Epidemiology, Research Triangle Institute. ELIZABETH MARTIN is Senior Survey Methodologist at the U.S. Census Bureau. JEAN MARTIN is Director of the Social Analysis and Reporting Division of the Office for National Statistics, U.K.
ELEANOR SINGER is a Research Professor at the Institute for Social Research, University of Michigan. 1. 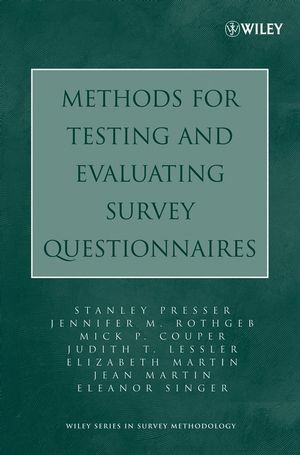 Methods for Testing and Evaluating Survey Questions (Stanley Presser, et al.). 2. Cognitive Interviewing Revisited: A Useful Technique, in Theory (Gordon B. Willis). 3. The Dynamics of Cognitive Interviewing (Paul Beatty). 4. Data Quality in Cognitive Interviews: The Case of Verbal Reports (Fred G. Conrad and Johnny Blair). 5. Do Different Cognitive Interview Techniques Produce Different Results (Theresa J. DeMaio and Ashley Landreth)? PART II: SUPPLEMENTS TO CONVENTIONAL PRETESTS. 6. Evaluating Survey Questions by Analyzing Patterns of Behavior Codes and Question-Answer Sequences (Johannes van der Zouwen and Johannes H. Smit). 7. Response Latency and (Para) Linguistic Expressions as Indicators of Response Error (Stasja Draisma and Wil Dijkstra). 8. Vignettes and Respondent Debriefing for Questionnaire Design and Evaluation (Elizabeth Martin). 9. 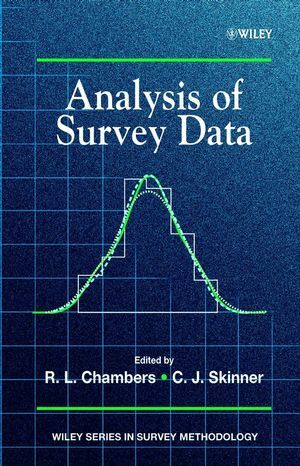 The Case for More Split-Sample Experiments in Developing Survey Instruments (Floyd Jackson Fowler). 10. Using Field Experiments to Improve Instrument Design: The SIPP Methods Panel Project (Jeffrey Moore, et al.). 11. Experimental Design Considerations for Testing and Evaluating Questionnaires (Roger Tourangeau). 12. Modeling Measurement Error to Identify Flawed Questions (Paul Biemer). 13. Item Response Theory (IRT) Modeling for Questionnaire Evaluation (Bryce B. Reeve and Louise C. Mâsse). 14. Development and Improvement of Questionnaires Using Predictions of Reliability and Validity (William E. Saris, et al.). PART V: MODE OF ADMINISTRATION. 15. Testing Paper Self-administered Questionnaires: Cognitive Interview and Field Test Comparisons (Don A. Dillman and Cleo D. Redline). 16. Methods for Testing and Evaluating Computer-Assisted Questionnaires (John Tarnai and Danna L. Moore). 17. Usability Testing to Evaluate Computer-Assisted Survey Instruments (Sue Ellen Hansen and Mick P. Couper). 18. Development and Testing of Web Questionnaires (Reginald P. Baker, et al.). 19. Evolution and Adaptation of Questionnaire Development, Evaluation and Testing for Establishment Surveys (Diane K. Willimack, et al.). 20. Pretesting Questionnaires for Children and Adolescents (Edith de Leeuw, et al.). 21. Developing and Evaluating Cross-National Survey Insteuments (Tom W. Smith). 22. Survey Questionnaire Translation and Assessment (Janet Harkness, et al.). 23. A Multiple-Method Approach to Improving the Clarity of Closely Related Concepts: Distinguishing Legal and Physical Custody of Children (Nora Cate Schaeffer and Jennifer Dykema). 24. Multiple Methods for Developing and Evaluating a Stated-Choice Questionnaire to Value Wetlands (Michael D. Kaplowitz, et al.). 25. Does Pretesting Make a Difference? An Experimental Test (Barbara Forsyth, et al. ).